Getting ready to undertake a home improvement project? Many homeowners get overwhelmed at the magnitude of a large DIY project or a contracted job, even simply not knowing where to start it and how to get organized. Erin Condren, organization expert and creator of the LifePlanners organizers, offers these professional tips and the tool of her “Level Up Your Life” activity sheet, a customizable actionable checklist Condren created with Liberty Mutual Insurance to help people get organized before, during, and after their home improvement projects. “I’m all for taking pen to paper when it comes to preparing for any project, so this is a great tool for people to utilize especially if they’re unsure where to start,” said Condren.The first section provides mini checklists to help get organized before embarking on a project, perfect for de-cluttering a room and getting ready for a tag sale with items you plan to sell. When it comes to hiring help and setting a budget, under “Planning for the Big Picture” you can find an easy-to-follow guide that shows what you should be writing down when creating a budget plan and what to make note of when researching contractors. In addition to the activity sheet, below are tips to follow when taking on a home renovation. According to a recent survey from Liberty Mutual Insurance, lack of organization causes worry for nearly one-fifth of Americans on a regular basis. You do not want to begin a home improvement project with this feeling of worry. Clean out clutter room by room and set solid completion dates for each room to be organized. Setting dates helps hold you accountable and makes sure no room is overlooked. If the room you’re renovating was used as storage space, sort through your items and decide which can be sold during a tag sale. There might be a reason this stuff has been in storage. De-cluttering this space will help you realize which items you can keep, toss, sell, or donate. You do not want unnecessary belongings taking up living or storage space in your new, remodeled space. Another home survey from Liberty Mutual Insurance found that over one-third (38%) of Americans feel that they need assistance or advice on managing a home improvement project. Some home improvement projects, such as those that involve plumbing or electrical, are best to leave to a professional. When hiring help, it’s important to research multiple contractors to ensure the most bang for your buck. Create a list that includes the contractors’ names, phone numbers, pros vs. cons for each, project type, and budget quote. This helps organize your thoughts as you’re meeting with each contractor and allows you to reference your conversations later in one fell swoop to make your final hiring decisions. No matter the home project – big or small – leaving a 15-20% cushion in your budget is necessary. The cushion allows you to be prepared for the unexpected without hurting your wallet in the long run. Use an organizer, such as the LifePlanner, to write down the project type and project to-dos. Document what you plan to accomplish during the renovation project and the exact improvements that will be happening along the way. Writing down the step-by-step process will help you visualize how big or small of a project you’re planning. Mapping out the project details in this manner will also make creating the budget an easier process since you can go line by line for each item. For more budget tips, Liberty Mutual has a new go-to resource MasterThis where you can view more home improvement budget tips in the “Tackle Home Repairs” MasterKit. Many of us have recently hopped on the smart home bandwagon and installed items like smart home security systems, smart lighting and thermostats, and smart locks in the home. If budget allows, consider purchasing smart home devices, such as locks, security cameras, leak sensors, or smoke/fire alarms. You might be surprised to find that installing these devices can save you money on your home insurance. I am only allowed to tell you part of what I saw at The ProSpective, but what I can tell you may alter the way you look at Home Depot, and power tools. It did me. For three days in April I participated in ProSpective, an invitation-only event sponsored by Home Depot in the company’s hometown of Atlanta, where 80 journalists, bloggers and influencers came together to get a look at the latest in tools for DYI and professional use. It was a first-ever opportunity for media to go behind the scenes and see how things work inside the home improvement retailer giant. On arrivals night, attendees had the option to tour the top-secret Husky lab, a place that is a chamber of horrors for tools, and a playground for kids who became adults who loved to blow up things. As one of Home Depot’s premier brands, Husky ensures its quality by constantly testing the limits on its products. While there were certain areas and tests at the lab that visitors are not allowed to photograph or write about, I will describe what happens there as a cross between YouTube’s Crushit and an episode of Jackass, but in this case engineers and technicians wearing ties and safety goggles are executing the torture tests. Here we saw machines shaking and dropping boxes from great heights, compressors exerting the weight of two Corvettes on top of tool chests, bolts being purposely rusted and weathered and then subjected to thousands of pounds of torque and force, flashlights frozen into buckets of water at 40°F, and straps and fasteners stretched to the extreme, until they snapped, to make sure they could all withstand superhuman abuse and still meet or exceeded the Husky quality standards, per their lifetime guarantee. I only wish I could post it all on online, to inspire all of those pyrotechnic-obsessed YouTubers, whose fascination with deconstruction might one day lead to a successful career. This was our first peek under the hood of Home Depot. The official Day One of the event began with a tour of the tiny town that is Home Depot headquarters, though they don’t call it that. To avoid sounding overly corporate, the employees refer to the complex as the Store Support Center, or SSC for short. Being an iconic American company with over 7,000 people walking through its doors each day, the company realizes it could be a target for bad guys, so security is tight. After showing ID and getting barcoded passes, we went one by one through revolving doors to enter. Once inside, we were given a tour of Main Street, the central passageway through the complex, which includes an on-site CVS and Minute Clinic, Starbucks, a dry cleaner, an in-house fitness center and childcare facilities. There’s also a museum dedicated to all things Home Depot, with artifacts from its founding days when Bernie Marcus and Arthur Blank, two guys who got fired from competitor Handy Dan, came up with the concept of a warehouse type hardware store. The founders’ story is a lesson in perseverance. At first they had a difficult time getting buy-in from investors and suppliers. In 1978, the DIY movement was just getting started, and most hardware stores were small neighborhood shops, like ACE Hardware, and customers and vendors were skeptical of the big-box store format. Home Depot couldn’t fill the shelves in the beginning and even resorted to staging racks with empty paint cans to make their inventory look fully stocked. Eventually, the concept caught on, and the store became the behemoth brand Home Depot is today. Similar to Disney, there’s a corporate culture of happiness that within a few minutes any employee will tell you about, with complete sincerity and appreciation. They will tell you that Home Depot cares about its people, and that’s why from the top down, the organization has a reputation of being a community member, where local stores give back through contributions of all sorts, including in-kind donations and labor. The company often organizes Team Depot philanthropic projects, where team members join together to give aid to those in need, such as families displaced by natural disasters. Through the Home Depot Foundation, one of the company’s largest charitable efforts is its support of US military veterans, who the company serves through numerous organizations across the nation and in their local communities at the store level. Home Depot also employs about 35,000 veterans across its 8,000 stores. Day two of the event was at Atlanta’s Ambient + Studio, an artsy warehouse space, where the leading tool manufacturing brands were on display. Greeted by orange-aproned helpers who handed us bags with 3M earplugs, safety goggles and face masks, the participants were divided into groups so we could tour through the space, visiting demos, similar to a trade show. The room reverberated with the sound of saws, drills, and nail guns. Representatives from the companies demonstrated the tools, some with entertaining and showy stress tests and comparisons with the competition. The company representatives were well versed, rehearsed and ready for us. It was hard to choose where to go next, surrounded by so many whirling and buzzing demos. I tried to get to each of the displays, though I wound up spending a lot of time at the Milwaukee booth, thanks to their very engaging ambassador — a handsome beefy guy with a great laugh and tremendous enthusiasm for his job of showcasing their tools, by putting them through their paces with a number of dramatic demos. First, he took a competitor’s measuring tape dispenser to task by pounding it with an enormous robot hammer, smashing it to pieces. Then he did the same test with a Milwaukee tape, which didn’t seem to put even a crimp into it. Then he stretched out the tape to 60 feet, alongside a competitor’s measuring tape, with huge balloons attached to the ends of the tapes. He recoiled the tapes at the same time, whereby the Milwaukee tape retracted within seconds, leaving the other leading brand, which I held, trailing behind. As I slowly reeled in the competitor’s tape, he beamed with pride. As I made the rounds, I was treated to previews of the newest, hottest goods making their way to Home Depot shelves. For the do-it-yourselfer, there were drool-worthy tools like the Bosch Daredevil drill bit that can punch through a cinderblock as well as hard steel; the line of Ridged tools for pro or DIY building, that come with free parts, service and battery replacement for life; the Dremel precision tools for engraving on just about anything; the DeWalt cordless air compressor that can go anywhere and double as a generator for your electrical needs for projects – or those outdoor parties; or the Makita pneumatic line-up with tools that can grind through stone, vacuum up the dust and absorb vibration, alleviating some of the worst, hardest, dirtiest and most dangerous aspects of construction jobs. There were also automotive products and accessories companies, such as Armor All, A/C Pro refrigerant, and Rain-x, touting a new long-lasting wiper blade. Besides demos and hands-on opportunities to try out the tools, attendees also got to talk to various Home Depot brand managers, who informed us about little-known services and departments of Home Depot, like the online Décor department, where customers can shop for everything from mattresses to wine glasses. After a full day of tooling around, it was dinner time, and game time, at Ponce City Market Skyline Park. This rooftop party space above a retail and restaurant complex, developed from the former crumbling and abandoned Sears, Roebuck & Company building, was a perfect venue for this crowd, who valued what vision, imagination, and industriousness and create. This place was a grown-up fantasyland: an open bar with craft beers, wine and champagne, delicious hors d’oeuvres of beef sliders, shrimp toasts and chicken skewers; and midway games, mini golf, and even a couple amusement park thrill rides. It was the perfect wind down, to relax in the warm late afternoon Atlanta sunshine, with a view of the city, sipping drinks and socializing in a laid-back atmosphere of literal fun and games. The next day we boarded the buses bright and early, at 7 AM, to head for a project site, where we were going to help build and repair homes of local senior veterans. The Home Depot crew had to switch gears quickly when the weather turned nasty though. Instead of the outdoor site, we were shuttled to the Furniture Bank of Metro Atlanta. This enormous warehouse and workshop recycles gently used home furnishings and builds furniture for thousands of families a year. The executive director showed us a video of some of the people who whose lives have been transformed thanks to the gift of beds for their families to sleep on, kitchen tables where they could have a meal, and furniture to sit on instead of the floor. Even among the hunky handyman with steely faces I saw some misty eyes, as we all realized the significance of our task at hand. We were divided into teams of four or five people per workstation, and from the racks of raw materials, we gathered lumber, bolts and nuts and the various pieces to put together basic furniture items. In a few hours, my team had constructed a kitchen table and three coffee tables. In all, our group of volunteers had put together 44 pieces of furniture, all of which the furniture bank executive director informed us would likely be delivered to families within the week. In fact, while we were working, the kitchen table we had made was claimed and on its way to a home in need. Our participation in this Team Depot project was the highlight of ProSpective for many of us, as we got to see the Home Depot giving spirit at work, and we individually were able to make a contribution and to learn about Team Depot projects, so that we can get involved in our own communities. Throughout the three days, the presentations were highly professional, and the event was well produced, which was even more impressive considering ProSpective was the first event of its type. Busses efficiently transported attendees place to place, and the itinerary was organized and thoughtful, hotel accommodations at Hyatt Atlanta Midtown were excellent, and even the food, including a delectable creamy kale salad to die for, by local caterer Avalon, was superb. If you have kids that wander the hallways at night — getting up to go to the potty, get a drink of water, or coming to get mom or dad to scare away the monster lurking in the closet, leaving a light on will keep them from going bump in the night, but that can be costly. 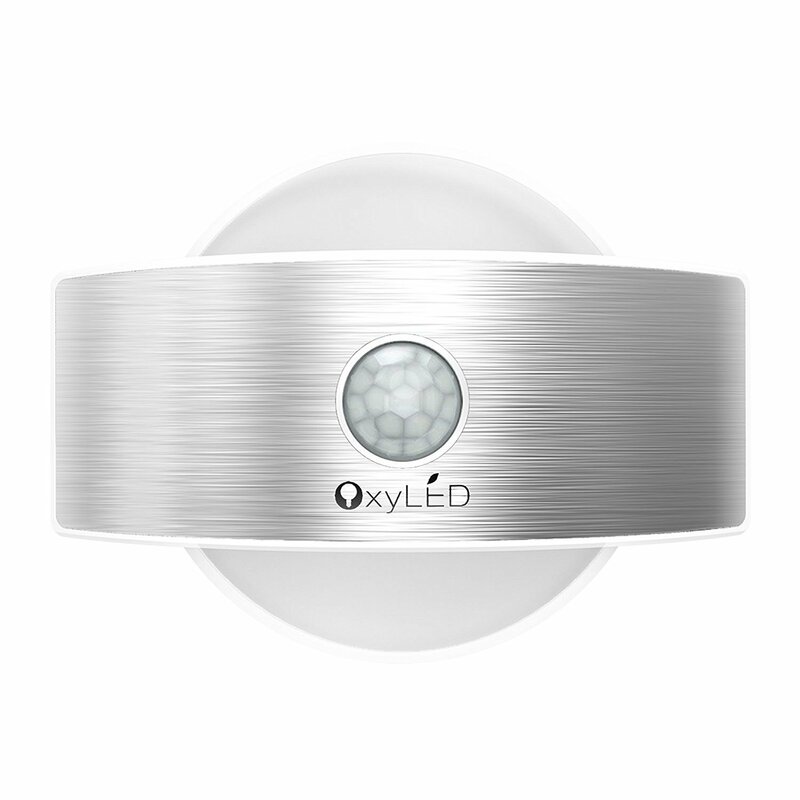 A better option than traditional nightlight is the OxyLED OxySense T–03S Wall Sconce, a stylish nightlight that is perfect for lighting spaces such as hallways, balconies, stairs, attics, basements, closets and other places where it’s not feasible to install a permanent light fixture, or where you need the convenience of lighting that comes on and goes off only when the hall or room is occupied. This nightlight, which gets its bright, white light from 14 energy-saving LEDs, is larger than a typical plug-in nightlight, measuring approximately 6 inches wide, and 4 inches tall. It does not require an outlet nearby, because it is charged using a USB micro plug cable or four AA batteries. The light can be mounted with the included adhesive strip or using the supplied screws. The unique design features a translucent disc that is illuminated behind a brushed silver-look band that features a jewel-cut globe in its center for decoration. The small globe also lights red while the unit is charging and changes to green when it is ready for use. The fact that this light can be recharged with a USB is a selling point for me, because I hate to be constantly replacing batteries, and because this light uses so little energy, it only has to be recharged approximately every six months. Because of its wireless design and its modern styling, the light can be placed just about anywhere, whereas some nightlights have an industrial look more suitable only for garages or hidden spaces like closets. I have used other light sensor fixtures, but this by far is the most sensitive, lighting up automatically when it senses human motion within approximately 10 feet, and it turns off 15 seconds after you walk away out of its sensing range. While it can be moved around as needed to light dark spaces, my OxyLED is permanently affixed above the door in my basement, where now when I enter the room my path is lit so that I can find the light switch, which has always been an irksome task, because the builder decided to hide the light switch behind the door. If you need a small space lit for convenience or safety, this is the best-looking and easiest night light of its type that I have found. This little device is designed to catch hair before it goes down the drain, and it can be easily removed and cleaned with a tissue or paper towel. It’s a great option if you don’t want to make an expensive repair, as in my case, or if you have a problem with clogs from hair going into the drain. My situation being a case in point, plumbers can cost a lot of money, and clogs can cause other problems besides inconvenience, such as requiring the use of dangerous acid-based liquid solutions to dissolve clogs. These chemicals are harmful to your pipes and also a hazard for humans, not just because they can cause skin irritation if they come in contact, but also because they can splash up and some have even been known to blind people. So far the SinkvShroom has been an easy fix, with no special installation required. I’m not looking forward to cleaning it regularly, but it’s a better option than clogs, and it beats losing my jewelry other items down the drain. One warning though, there is a gap of about a half an inch that allows water flow, so small jewelry can still fall down the drain, but you may get an extra second or two to retrieve it if it bounces off the Sinks Shroom. The Sink Shroom fits a typical utility sink drain, which is about 1.25 inches in diameter. It’s made of high-grade material that is resistant to corrosion and discoloration. Find out where you can get it at www.tubshroom.com. What are factors to consider deciding between a traditional or a gas fireplace? In order to have a traditional, wood burning fireplace you must have a working chimney for ventilation. A chimney sweep can easily inspect this for you at a reasonable cost with prices averaging between $125 and $250. Other factors to consider are cleanliness, safety and relative cost per use. How can I inexpensively update an old fireplace? Fireplaces have come a long way since the traditional red brick and concrete. To achieve a sleek look, replacing dated brick with a metal surround to make your fireplace more contemporary. To achieve an expensive-looking marble look on a budget, use marble-look adhesive paper helps. Simply cut the adhesive paper into squares and cover the existing fireplace tile to transform your space. Applying the paper can bring a new focal point to your room and look like you’ve made a major upgrade. 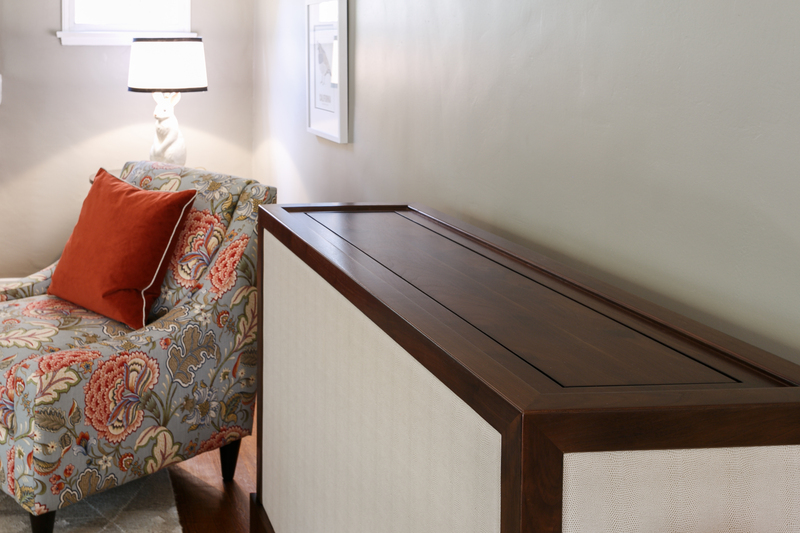 Updating the mantle is another easy option. Dress up your mantle each, like a wreath during the holidays or nautical decorations in the summertime. How do I safety and easily start a fire? Before starting a fire, make sure your fireplace is clean to use. The National Fire Protection Association recommends sweeping and inspecting chimneys at least annually, usually taking place before your first fire of the season. This helps prevent the potential for a chimney fire. Once your chimney is clean, starting a fire is easy. If you already have a stack of seasoned firewood to use, try a mess-free Firestarter like the new Pine Mountain® ExtremeStart™ Firestarter. Simply place the firestarter below your seasoned firewood, light it at the indicated arrows, and your fire will spark up into flames within minutes, with no need to add kindling. If you do not have firewood readily available, try an American Home™ by Yankee Candle® Balsam Fir Firelog. The wrapped log, which gives off a fresh scent fresh, is easy to light and requires no maintenance, so you can enjoy the ambience of the fire without having to collect or buy firewood. What are some tricks to make a fire last longer? The kind of wood you’re working with is important. Damp or green wood cause creosote buildup and do not light easily. Stack up with dry, seasoned firewood which burns cleaner and longer. Also, keep the display simple. Place larger pieces of wood on the bottom, then place additional pieces of wood in the opposite direction. Place smaller pieces above this in the opposite direction. This simple patter will keep a fire roaring for hours. Is there a “wrong” way to use a fireplace? Manu users overlook safety measures for proper fireplace use. Even if you hire a professional chimney sweep once a year, it’s important to also self-clean your fireplace and chimney. This extra can remove dangerous creosote buildup in your chimney. Creosote is the chemical mass of carbon formed when wood is burned that needs to be periodically removed. One easy way to remove creosote is with a Pine Mountain® Creosote Buster® Firelog. Simply add the log to an existing fire at the start of the season and after every 40 fires. When heated, the powder in the firelog changes to an active gas and attacks the creosote in the chimney. If you opt to start a fire with wood instead of a firelog, choose hard woods like oak and maple that produce an intense, sustained fire, so you to burn less wood. Minimize soft woods like pine. Pine starts easily but burns quickly and gives off less heat than hardwoods. Pine also contains sap which can cause increased creosote build-up in your chimney. The Brown family was immersed in technology in their daily lives at work and school, but at home, their living room was still in the dark ages. 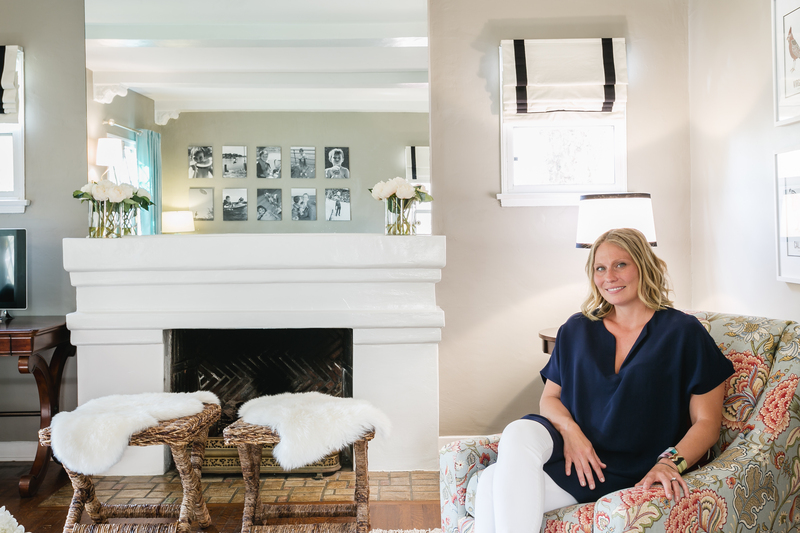 Here is how Los Angeles interior designer Andee Ferrer took on the task of transforming the “great room” of their 1930s Spanish-style duplex into a contemporary, smart and connected hi-tech haven. As a designer of the digital age, Ferrer didn’t need to leave her laptop to reset this room with all the latest devices, décor and computer comforts of modern life. First thing Ferrer did was send the Colonial-style entertainment center off to the woodpile, via TruckBuddy. Next the sagging drab olive sofa and loveseat, bulky coffee table, 26” TV, DVD player, stereo receiver, five-CD changer, external speakers and other vintage electronics and furnishings, found new homes via craigslist. Then, it was time to refresh the scene. 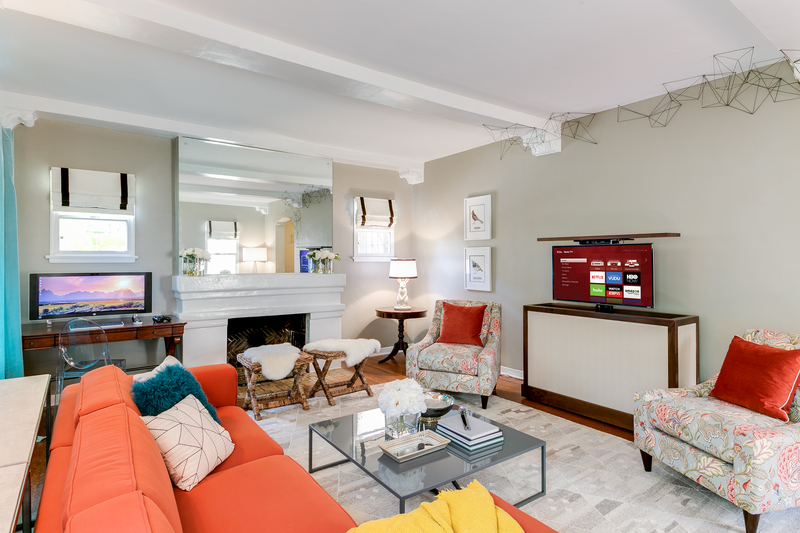 While a TV is the centerpiece of a traditional family room, Ferrer eschewed the eyesore of a wall-mounted TV and tucked it away in a custom-built Cabinet Tronix television cabinet. With a touch of a button, the TV emerges, neatly and discretely, connected to half a dozen media peripherals, including a Blu-Ray player and X-Box, which are also hidden away, enclosed in a compartment at the bottom of the unit. 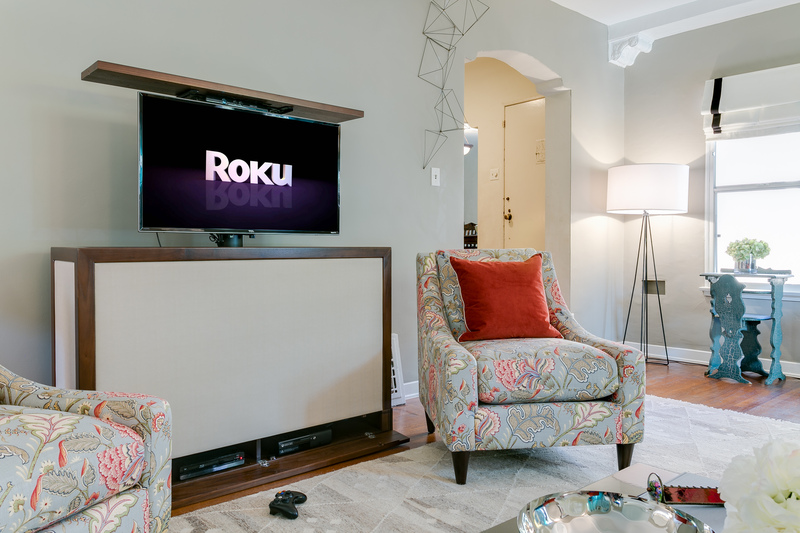 Inside the cabinet, the family’s former tiny TV was upsized and upgraded with a 43″ TCL Roku TV. Since streaming is the new cable, the family cut the cord, and cost, and now uses a TERK Trinity Indoor Amplified HDTV antenna to get basic channels sans subscription. Atop the cabinet, a stylish Sonos Playbar connects to the TV via optical cable and lends rich AV sound. The app-controlled system connects with other Sonos speakers in the house to stream free and paid playlists from sites like Pandora, Amazon Music, and Spotify. To amplify Wi-Fi throughout the house, a TP-Link VR900 modem/router is paired with the eero extender system to boost bufferless audio and video streaming. 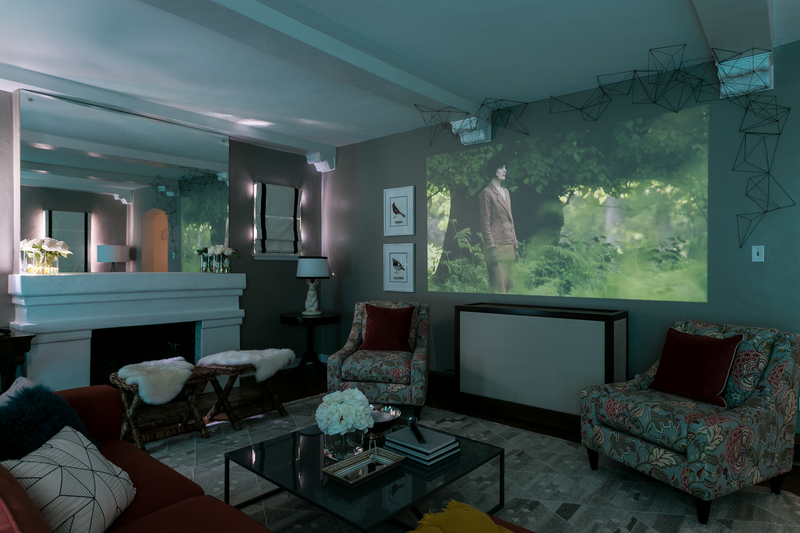 Above the lift cabinet, Ferrer used the wall space as a projection screen for a ZTE Spro2 projector. 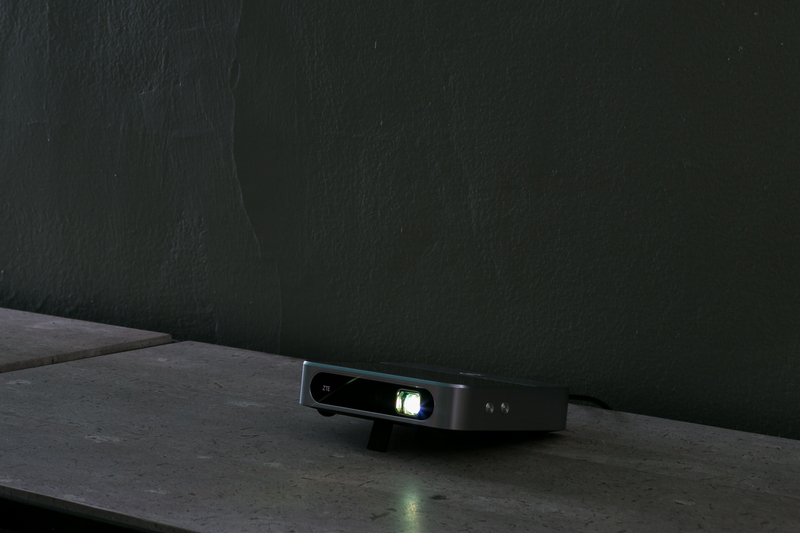 The palm-sized tablet-like projector transforms the living room into a cinema, streaming directly from the device or connecting to other devices via USB or HDMI cable. After some research, Ferrer learned that the best color wall for projection was not white, as one might expect, but grey. 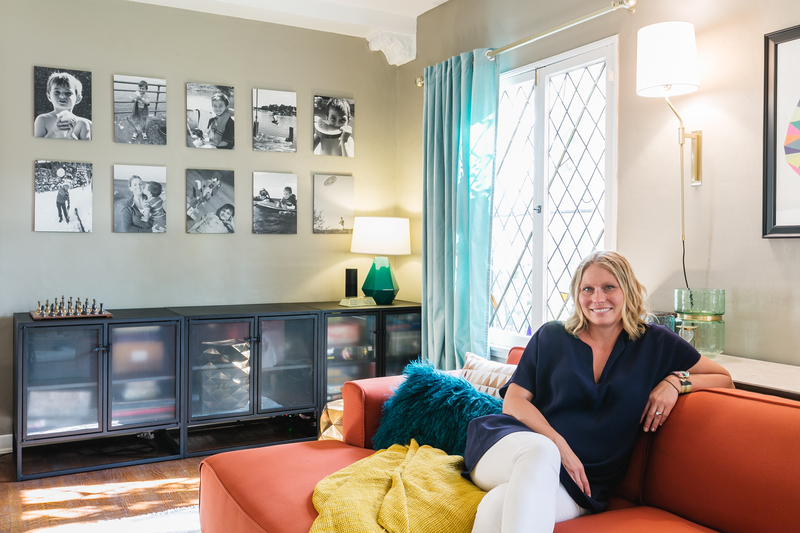 She chose Sherwin-Williams Passive Gray to make the colors pop and show vividly on the wall. To outsmart kids prone to leaving lights on, the Lutron Maestro motion sensor automatically turns lights on and off, and to set the mood lighting, the handy Lutron Caseta Wireless controller dims lights and raises and lowers blinds while iDevices switches wirelessly control the Robert Abbey Delta Emerald Glazed Table Lamp and floor fan, while the heat and AC are controlled by a Honeywell Lyric thermostat. Both wireless controllers and the thermostat respond to app or voice commands by Amazon Echo, which can also play music, update a Google calendar, report the news, and even read the kids a story. The family can play it safe anywhere in the home with Samsung smartthings hub home monitoring kit which sends alerts via app if anyone passes a sensor or opens or closes a connected door or window. 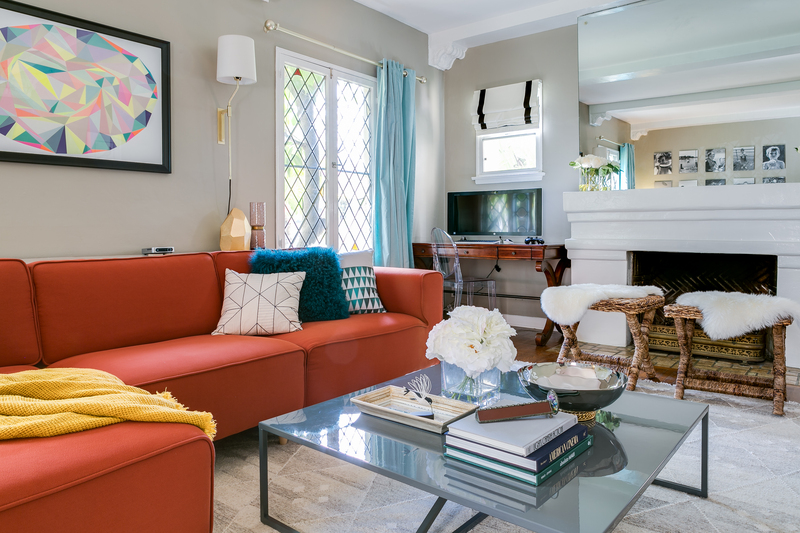 A couch is fundamental in a family room, so Ferrer started by replacing the old sofa and loveseat with a bright, comfortable contemporary sectional with a lounger sidecar from Article. Ferrer also found beautifully floral-patterned side chairs and marble top sofa tables by La-Z-y Boy, gray lacquered BluDot Strut Square coffee table, a ghost chair from InStyleModern, two Safavieh benches from Wayfair for extra seating, a gold geometric gardening stool by IMAX to serve as an end table, and a modern IKEA large-shade floor lamp. Other textile pieces included Sanela room darkening draperies in light turquoise and faux skin rugs for the stools from IKEA, a Safavieh Hand Woven Natural Kilim Ivory Wool Rug and comfort padding from Overstock, Roman Shades by Pottery Barn, and fabric panels for the Cabinet Tronix lift cabinet, featuring Robert Allen fabric in Tiny Pebbles Parchment design. To help brighten the room when it was not in use for projection viewing, Ferrer mounted two bright satin brass Robert Sonneman Palo Wall Sconces, which freed up space where floor lamps once stood. No makeover is complete without the accessories. In keeping with an underlying gold and silver theme, Ferrer found an elegant silver bowl with bronze beading from Beatriz Ball collection, which complemented other metallic décor in the room including gold-accented vases and geometric shapes from Gold Leaf Design Group and unique Wall Play wire designs she used to sculpt and frame the projection “screen” to create anticipation on the wall. Adorning another wall were two bird prints by Wooden Pencil Company, featuring a California quail and Virginia red cardinal, representing family member’s two home states. 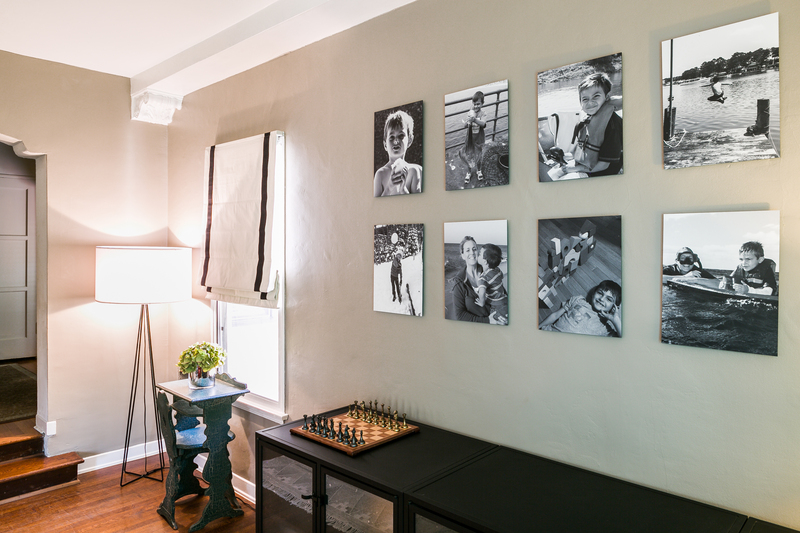 Across one wall Ferrer displayed a collection of black and white family photos created on aluminum by WhiteWall, a German company specializing in gallery-quality prints. 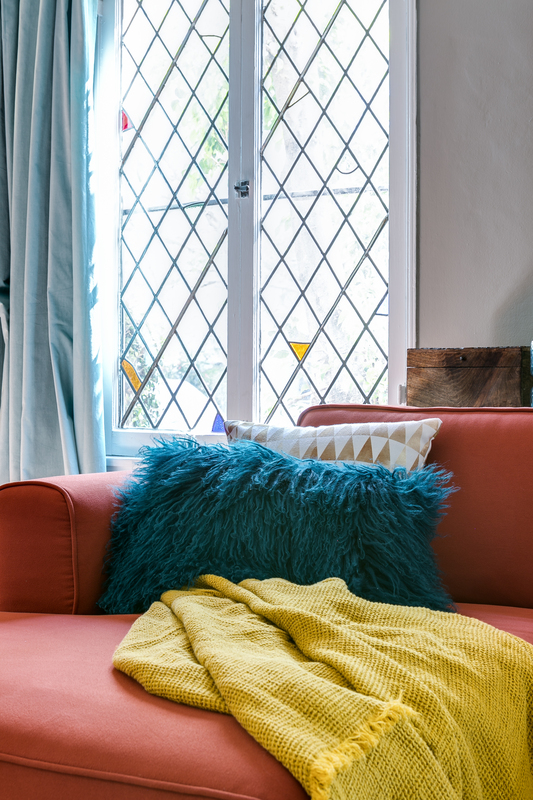 Centered above the sofa hung a Nurai Mora 2015 Artist Event Print from IKEA, which carried through the geometric design theme from the wire sculpture, the table sculpture and the leaded glass windows. Ferrer softened the room with geometric-patterned pillows from Fab and luxurious linen and wool throw blankets from COAST New Zealand. She picked up all the remaining tchotchkes she needed, including silk flower arrangements, at HomeGoods. 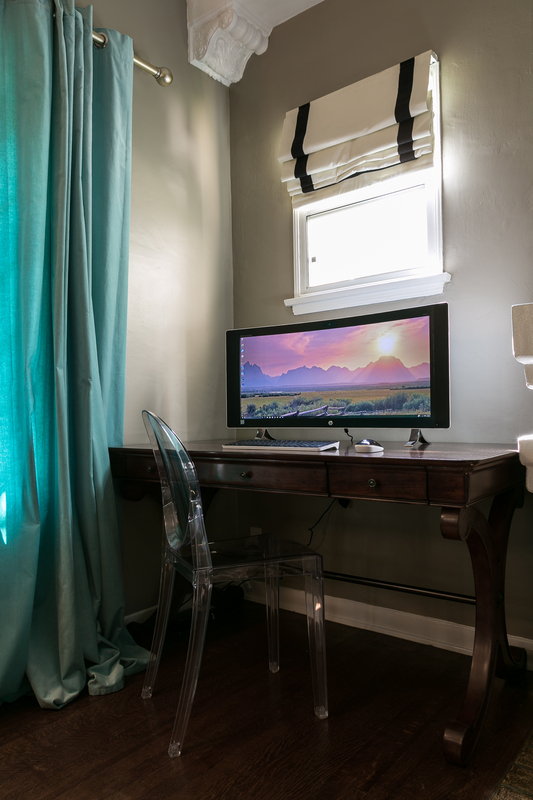 Because the room served as a home office for parents and a study room for kids, Ferrer placed a Liberty Furniture Brookview Writer’s Desk in one corner, which held the sleek workhorse Intel-powered HP Envy 34” Curved All-in-One PC, loaded with Windows 10 and featuring a Bang & Olufsen audio system, which serves as both entertainment center and homework base. Homework or play can become a family affair by using the Nyrius Aries Pro wireless HDMI transmitter to stream content from the desktop to the TV or projector or other HD device. Just as the Tronix cabinet was a sophisticated hideaway solution for the TV, Ferrer wanted to make the room multifunctional as a family play space and a place where adults could entertain, without being surrounded by kids’ playthings. Three Casement black sideboards from Crate & Barrel, with the glass covered with frosted glass film, served to neatly and discreetly store all of the family’s board games, toys, and electronic peripherals. In case you worry that you have to be an IT genius to set up and enjoy this room, fret not. Even if you have trouble programming your universal remote, anyone can be king of their smart domain with the help of HelloTech, the “Uber of tech.” All in all, it took one of their hero tech a few hours to unbox and get all of the electronics in the room and throughout the house up and working together. Editor’s note: Companies featured in this article provided product samples or services for reviews, but the all opinions expressed belong to the author.